There has been a great deal of talk lately about consumer deleveraging, particularly with the focus on consumer credit. 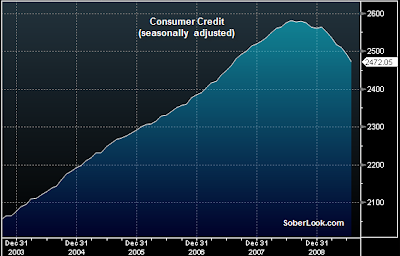 The Fed tracks consumer credit separately and releases the number fairly frequently. Based on the chart below, some deleveraging has in fact taken place. However, the Fed number for consumer credit excludes any real estate loans. This next chart shows consumer credit and mortgages as percentage of household disposable income (also from the Fed). In 2003 consumer mortgages (including home equity) were 82% of household income. That number shot up to over 100% in 2007, dropping to over 95% by the end of the last quarter. There is still tremendous amount of debt reduction to go before we get to 2003 levels. 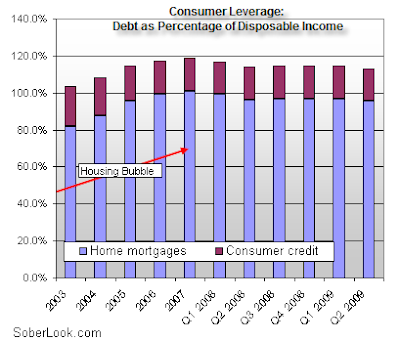 Unless household disposable income suddenly improves, the deleveraging of the consumer will take some time.